It’s no secret that Cobbers run on caffeine in its various forms. I personally have four to five cups of coffee a day to get me through twelve hours of BREWing. While there are several places on campus you can grab a “cup-a-joe” going off campus to coffee shops is a lot more experiential. 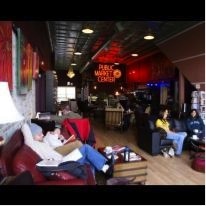 Coffee chains like Starbucks and Caribou are great for satisfying our caffeine fix, but if you’re looking for an all around immersion in ‘coffee culture,’ I would dare you to be a little hipster and sample the coffee houses Fargo-Moorhead has to offer. One of my personal favorites is Babb’s Coffee House in Fargo. Walking into Babb’s is like walking down the hall and stopping in your living room for some relaxation by the fire with a good book. All right, Babb’s is missing a fireplace, but it has everything else. Plush couches are set up around glass coffee tables with Hom Furniture styled lamps perching on side tables. If the Type A caffeine addicts prefer a more structured environment, there are multiple round tables, big enough to spread out your homework. One of my favorite tables is something you would put in your kitchen at home, booth seating on one side and leather kitchen chairs around the others. Aside from the array of seating the coffee is unique. You can get about 25 different flavors of lattés, mochas, and cappuccinos. Iced, hot, blended, you name it. If you don’t prefer coffee, tea, fresh squeezed lemonade, and chai are offered. The food isn’t that great but who goes to a coffee shop for food anyways? Babb’s is satisfactory in the sense that the coffee isn’t all sugar, but it’s not black coffee either. At Caribou you get sugar with a side of coffee. At Starbucks you get espresso with a pinch of sugar. Babb’s is the happy medium. There are a few aspects of Babbs that aren’t prime. For example, you only get two hours of free wifi access, and sometimes the wifi is faulty for 45 minutes of those two hours. If you have online assignments to do, don’t go to Babbs because you’ll get frustrated. Also, the music is either something you adore or despise. One day I was drinking chai to Les Miserables (love) and the next it was old jazz and 50’s rock. It definitely shouldn’t be a defining factor, but if you’re particular when it comes to music and mood bring headphones just in case. Overall, I would highly recommend a visit. Go, grab a latte, sink into a couch, and relax. It will be good for you.